This lightly perfumed, deluxe foaming lotion soap has been enriched with Aloe vera for moisture and vitamins to replenish vital skin nutrients. 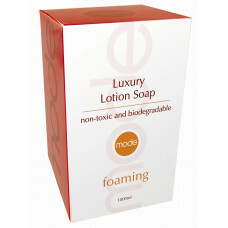 Gentle on the skin, Mode Luxury Foaming Soap leaves your skin feeling cleansed and revitalised. Luxuriously decadent, Mode Luxury Lotion Soap contains all the goodness of vitamins A, B and E, and hydrolysed collagen to soothe, replenish, moisturise and condition the skin.